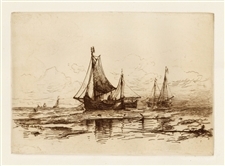 Home > Browse by Artist (A-D) > D > de Haas, M. F. H.
Mauritz Frederik Hendrik De Haas original etching "Fishing Boats on the Beach at Scheveningen"
Medium: original etching. Executed in 1883; this is a rich, dark impression on heavy cream wove paper, from the "Original Etchings by American Artists" portfolio, published in 1883 by Cassell and Company. The plate size is 6 1/4 x 8 5/8 inches. In good condition with full original margins. Signed by Mauritz Frederik Hendrik De Haas in the plate (not by hand).